Mary Karr. 2015. The Art of Memoir. New York: Harper Perennial. Writing a memoir evokes a special brand of fear. No matter how you approach the topic, the fear is that your life story is not worthy of being told and the mere attempt to tell it is to be guilty of exaggeration and pride. No matter how good the writing, the fear is that you do not stand in the company of presidents, kings, and celebrities. Against this fear, one can only aspire to write clearly with distinction and to seek out a good book or two to aid in this vain enterprise. In her book, The Art of Memoir, Mary Karr points to other motivations, somewhere between the writer “trying to make sense of the past” and “readers thirsty for reality” (xiv). Memoir invites the reader into the private life of the author in a verbal strip-tease, undertaken for catharsis or paid therapy (xxi). Something anyone can aspire to writing memoir, even if the readers may be limited to an immediate circle of friends and family. The primary requirement is having memories that you are willing to analyze against a particular theme and to share with readers. These memories need not be absolute truth, but they need to be spoken with an authentic voice. The truth of memoir is not absolute—sworn on a Bible—truth, but rather a more interesting subjective truth—truth told with an authentic voice. It is subjective, in part, because we lie more often to ourselves than we do to other people. Karr validates her own accounts with the people she writes about (5). It is interesting, in part, because an authentic voice embeds the veils that we use to cover our inadequacies. Uncovering the veils and exposing the lies they cover up is painful, as Karr explains: “You have to lance a boil and suffer its stench as infection drains off.” (12) Yet, this catharsis liberates our true selves, a necessary step in healing and in personal growth, as Karr admits: “I often barely believe myself, for I grew up suspicious of my own perceptions” (22). Part of authentic voice is admitting your motivation in writing. Karr argues: “Unless you confess your own emotional stakes in a project, why should a reader have any?” (97) While this advice might seem to be a terribly female observation to make—why can’t I just lay out my hypothesis, you say?—communications professors often admonish their students that complete communication requires both an idea and an emotion. Authenticity requires complete expression—why is that hypothesis so important that you spent at least a year or more examining it in great detaiI? Chances are good that the emotional stake is already substantial and its substance needs only to be recognized in your writing. A novelist might refer to this stake as an emotional hook to grab the reader. Karr’s voice shows ironic tension. She is consciously literary—dropping great quotes from famous memoirists and dotting her work with cutesy new ways of expression. The tension arises when you see her photographed wearing blue jeans and cowboy boots more fitting of her Texas upbringing. “The lady doth protest too much, methinks” as Shakespeare writes in Hamlet. Voiced tension is a source of conflict and, as such, is interesting. Cowboy boots aside, Karr writes prescriptively in 24 chapters, each with its own theme. A particularly important theme in her writing comes in chapter 6: Sacred Carnality. One’s mind naturally runs to carnal, as in carnal knowledge. But, Karr uses carnal to mean sensual in description, as in the five senses—seeing, hearing, smelling, tasting, and feeling (71). For those of us more comfortable in non-fiction, analytical writing, this carnality is necessarily forced, as she readily admits (75). By utilizing carnal description to move the action, dialog can be used more like a spotlight. 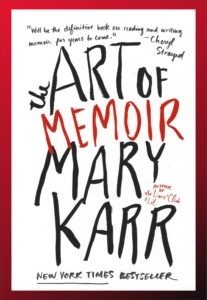 Mary Karr’s The Art of Memoir is helpful addition to any writer’s library. Karr’s cites from numerous famous memoirists (check out the appendix listing) aptly makes the point that memoir is a wider genre than the usual political and celebrity autobiographies. The creative potential in memoir is also greater than the usual A-B-C chronologies. A favorite film of mine, Francis Ford Coppola’s Apocalypse Now (1979) was, for example, a memoir by William Herr: Dispatches (1977). Karr’s book has already encouraged me to purchase a memoir that she recommended; it has been a great encouragement in my own memoir project; and I have already gifted this book to a friend. Great book; read it. Angelou, Maya. 2009. “I Know Why the Caged Bird Sings.” New York: Ballantine Books. Herr, William. 1977. “Dispatches.” New York: Alfred A. Knopf.